The original Blossom Smart Watering Controller was an ambitious product, with support for 12 zones, weatherproofing for indoor or outdoor installation, and—unique in this space—support for powerline networking in addition to built-in Wi-Fi (in case you needed to put it in a spot that turned out to be a Wi-Fi dead zone). The product also carried an ambitiously high price tag of $180, so Blossom (which was acquired by Scotts Miracle-Gro in December) went back to the drawing board, stripped out less-important features, and pared the number of zones down to seven (eight if you re-configure the pump-start relay). The Blossom 7 Smart Watering Controller is now the only model Scotts sells, and while it looks nearly identical to the old Blossom 12, it no longer includes outdoor weatherproofing and has dumped the powerline feature. The new price tag is $149, though it’s already easy to find for less than $100. The hardware itself is a slim, lightweight piece of plastic that installs quickly (at least once you manage to get the stiff cover off). Sprinkler leads install via wire clips on the inside of the box (use a screwdriver to push down on the tabs to make this easier), then you plug the device into wall power. 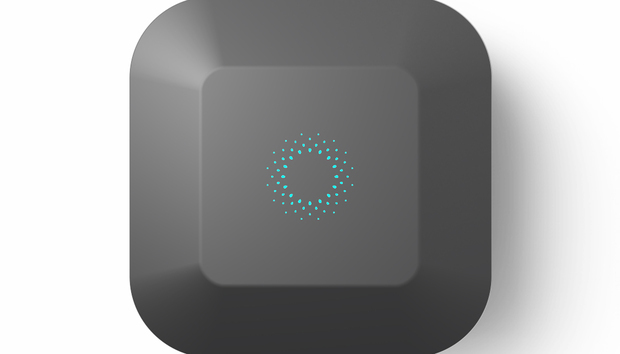 The rest of setup and daily interaction take place via the Blossom app; like the competing Rachio controller, there are no manual controls at all on the box itself. A simple slider lets you control the overall volume of water, but this may be too basic for some users. The goal with the Blossom hardware is to keep things simple, and that’s clearly the angle with the app, as well. Like most smart sprinkler devices, it includes a “smart watering” program that can automatically determine the best watering regime for your garden and cancel a cycle if it recently rained. And like other smart sprinklers, “best” is relative. 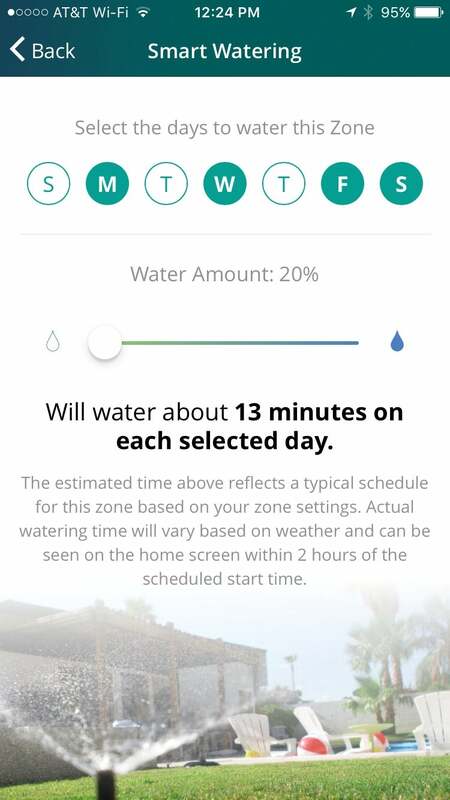 Blossom took a small number of parameters along with my location to determine that my plants should get 27 minutes of water, five days a week. Small changes to these parameters resulted in huge shifts in the recommended watering regimen, with some recommendations proposing twice as much water each day—which would have been far too much. The good news is it’s easy to adjust the total water flow delivered by the program by simply dragging a slider left or right. 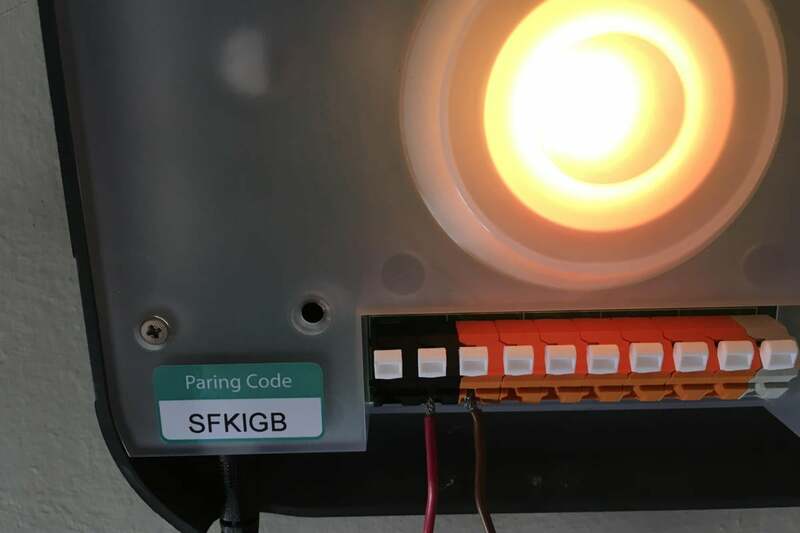 The system’s “soak cycles” can automatically split up water delivery sessions over the course of the night to give water a chance to soak in and avoid pooling. Ultimately, I nixed the smart recs and went with a manual program, but this too is on the simplistic side. You can’t set an every-other-day schedule, for example, but you can pick days of the week or manually choose days of the month from the calendar to water, which is a rather tedious process. You can set a specific time to water or tell Blossom to start a certain interval after or before sunset or sunrise. This is a neat feature, but I found I had to force-quit the app more than once to get these settings to stick. Another handy feature: You can “hibernate” Blossom if you don’t want water to run at all during certain times of the year. All told, the app isn’t difficult to use, but the way some of it is laid out isn’t 100-percent intuitive. Spring clips hold wires in securely; the status light doubles as a handy flashlight when the cover’s off. Its feature limitations aside, Blossom worked fine in my testing, but while it is petite and elegant, both from a hardware and software standpoint, there really isn’t much to it. Yes, there’s an Alexa Skill that lets you use voice commands to manually run the water, but otherwise it doesn’t connect to any smart home hubs. A bigger deal is that the Blossom app doesn’t even send push notifications (and can’t be configured to send them) when watering stops or starts, or if there’s an error with a watering cycle. That said, if you need “set it and forget it” watering and don’t want or need advanced configurability, the Blossom’s biggest advantage—a rock-bottom price—makes it arguably worthwhile.